Still Need Tickets? It’s Easy! 3) Enjoy the day celebrating amazing modern architecture + design! 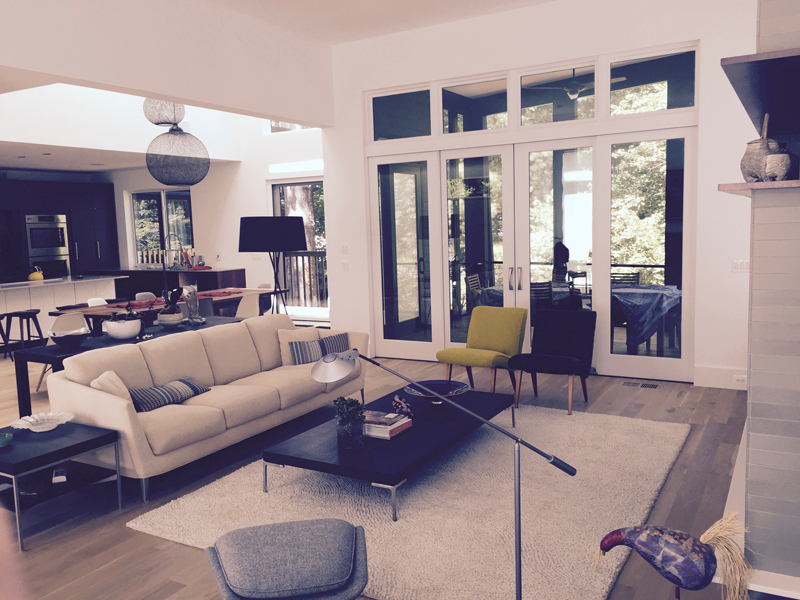 The Takoma Park, Maryland home and garden of designer Jackie Braitman. July, 2015. This extensively remodeled “worker’s” bungalow has an eclectic mix of modern and craftsman finishes and details. The original home was quite modest with finishes that hinted at a worker’s budget rather than a middle-class budget. 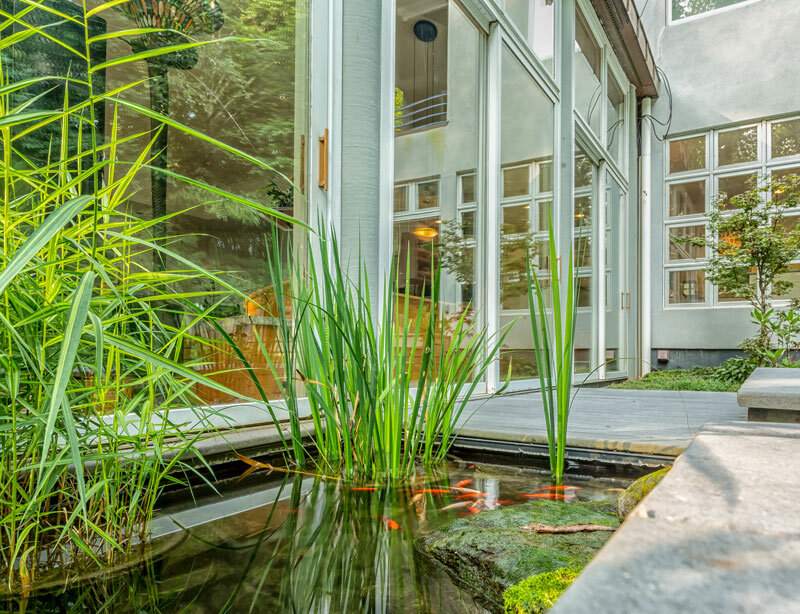 The now expanded lower level is an open plan family room with modern kitchen, living and dining all connected to a serene and private sculpture garden and koi pond. 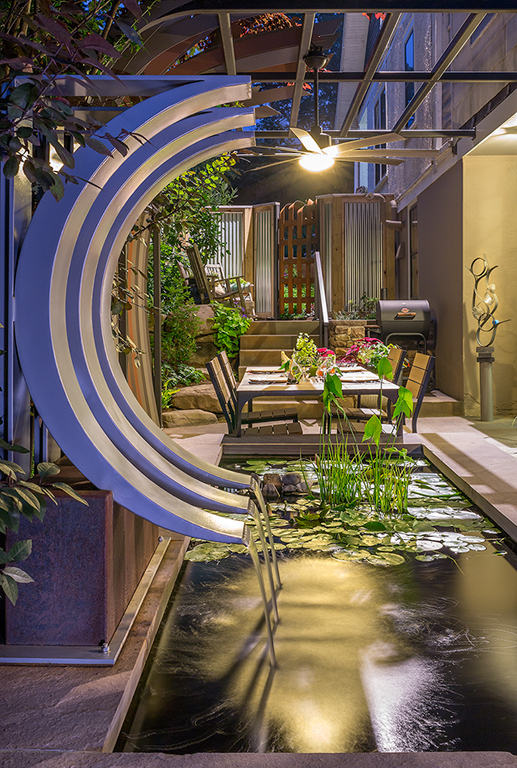 The true indoor-outdoor connection makes it feel like you’re living in the garden whether you’re indoors or out. 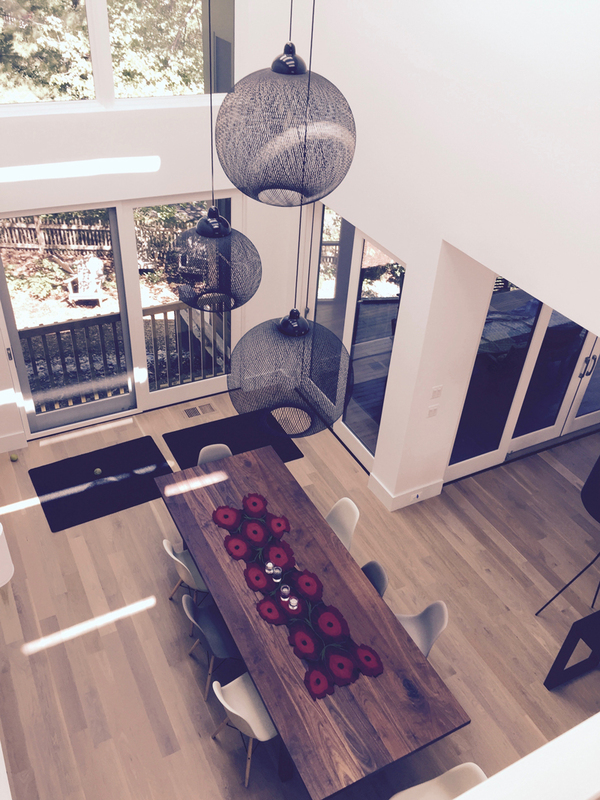 The custom fountain and sculptural elements are brought indoors with almost floor to ceiling windows and doors. 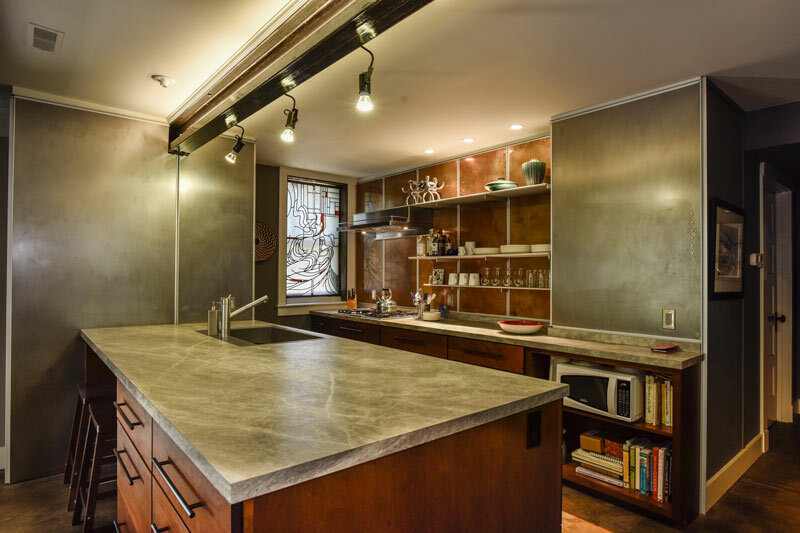 Modern elements include a stained concrete floor, exposed beams and columns, and modern aluminum & copper shelving. This is juxtaposed with 2-part crown molding and oak windows with a 6-lite transom that echoes the 6-over-1 historic sash windows on the first and second floors. The second floor has the original front dormer plus a new large back dormer. The area is vaulted with open LVL studs rising from 6ft to the ridge. The corrugated metal ceiling bounces light between the front and back of the house through the porous upper wall. 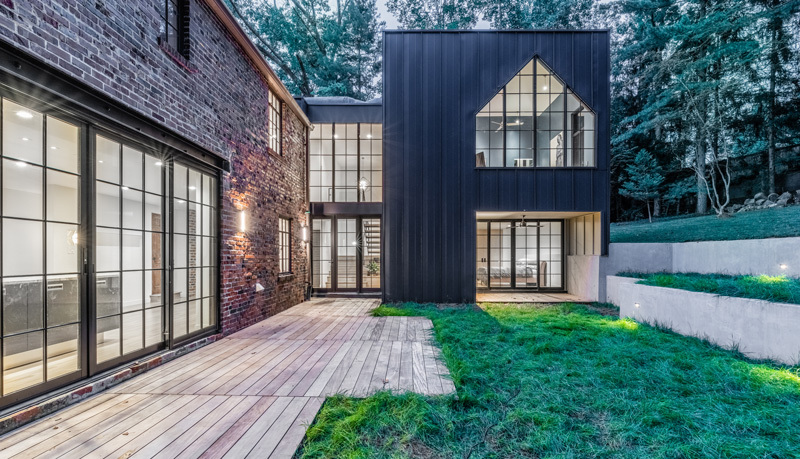 The finishes and architecture have an unusual industrial-modern design that works with the rest of the house. The back room is an office that opens onto a large balcony. 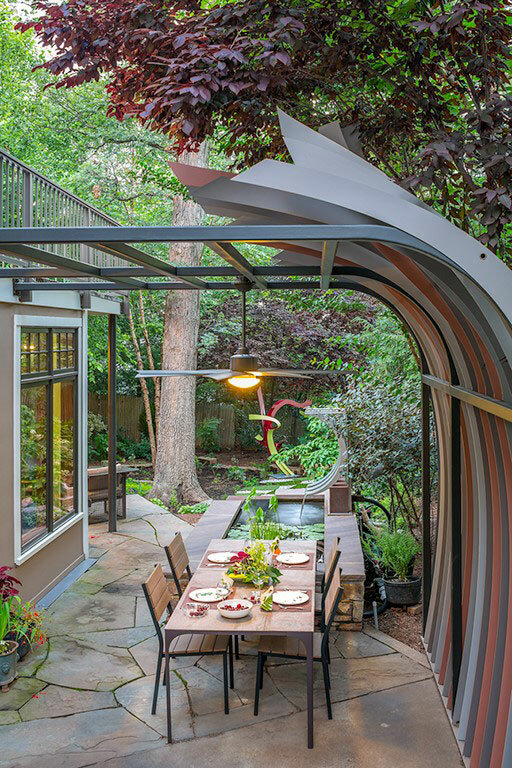 An aluminum water-jet cut pergola and large “over-planted” corrugated steel planters create a lush garden room with terrific views over the neighborhood. 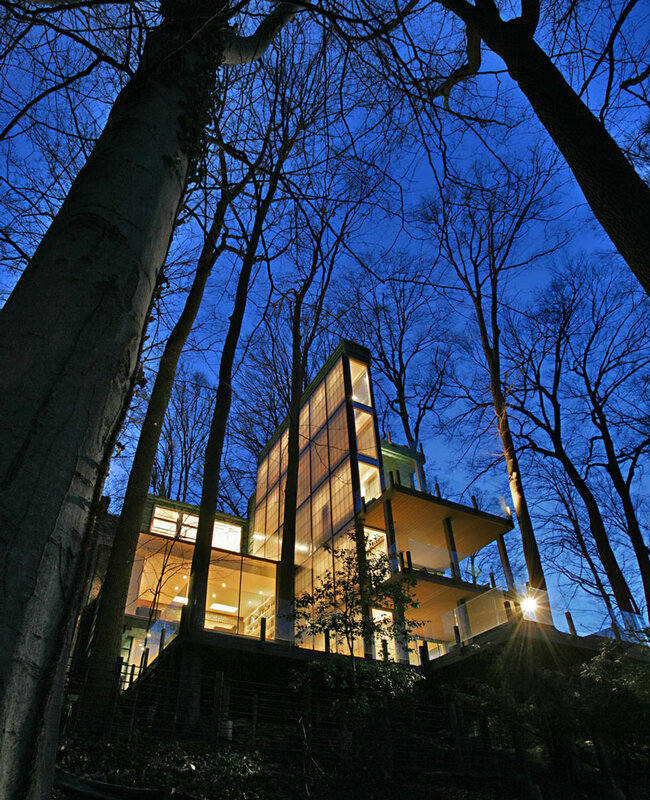 The home is close to the high-point of the neighborhood so the tree-top views are spectacular. The entire main floor of the house is a working sculpture studio. The homeowner is an architectural and landscape designer and maintains a fully integrated practice of sculpture, architecture and design. Product prototypes and gallery-quality sculpture in steel and glass are created in this studio. This renovation and addition to a 1920’s era bungalow is the story of the stewardship of an existing resource from a state of aging into a “second life,” blending tradition and modernity in form and detail. Sagging structural elements and a cascade of subsequent incremental failures such as leaking window heads and walls out-of-plumb necessitated the removal of the roof and second floor. Although doubling the square footage of the house, the goal was to avoid “mansionization” and preserve the original intimate character of the house. 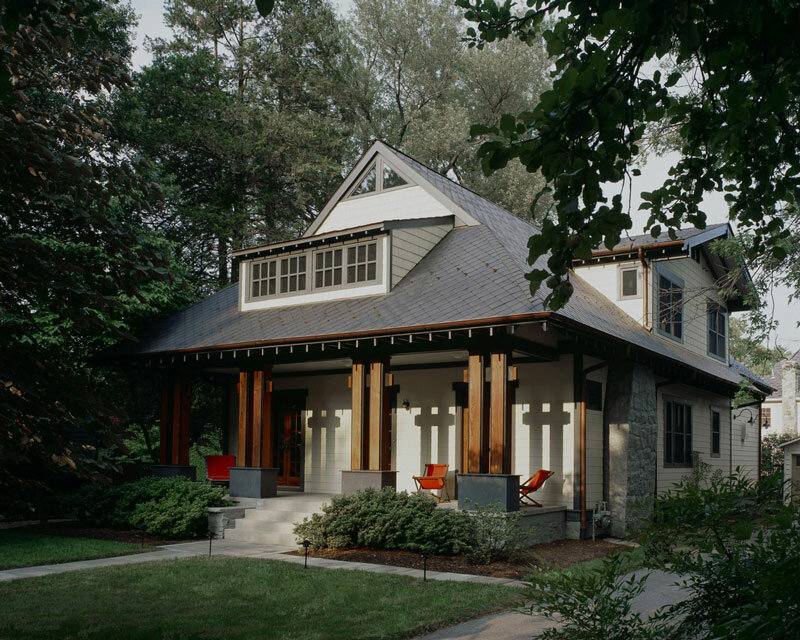 A garden addition and new second floor were configured under a new form-hugging roof that kept the original bungalow character, yet blended with the Asian-modern sensibility that guided the design. The front of the house preserves the bungalow character while hinting at the modern transformation on the garden side. 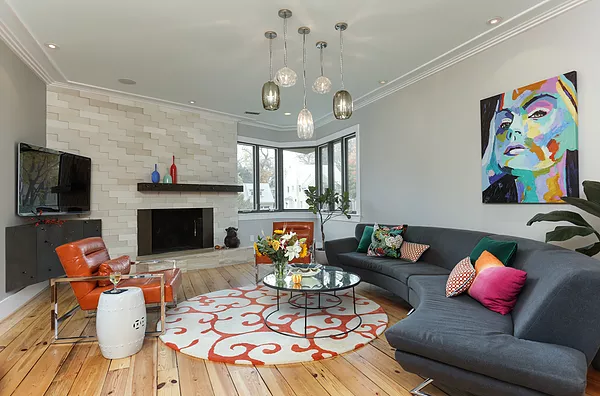 A series of cross axes from front to rear provides a gradual transition from the cozy original living room to the light-filled and expansive garden rooms. 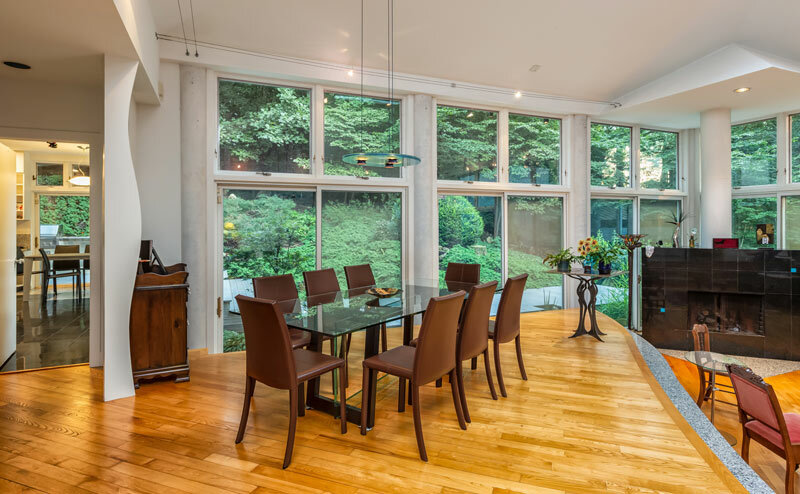 The kitchen, an integral part of the garden rooms, connects to dining, veranda, and a screened porch, all of which overlook a terraced garden. Sky-lit upper floor rooms are tucked under the roof in front and open onto an airy balcony in the rear. 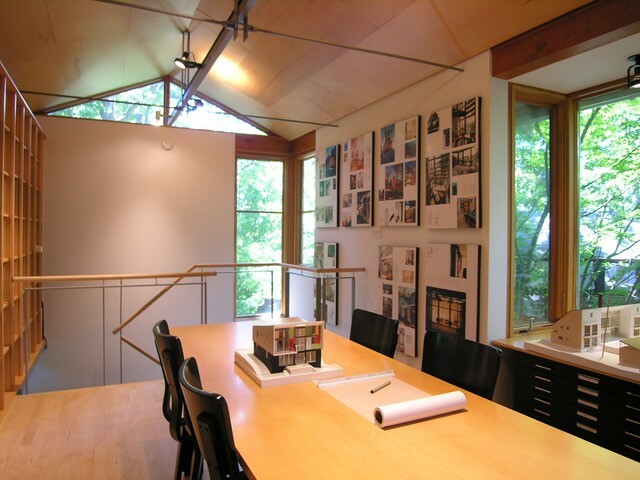 Sustainable design strategies included the reuse of the house as an existing resource; use of salvaged forest products and recycled roofing; careful choices about shading, orientation, and daylighting; high-efficiency lighting and HVAC systems; and attention to indoor air and water quality. This early Travis Price home lies completely surrounded by parkland and was made to fit into its place with grace and efficiency. The large living/dining room holds more than 100 people for house concerts. The curve in the steps between dining and living areas follows the topography. The entire back wall is glass, looking out to Rock Creek Park. The fireplace and ash floor make the space warm and inviting. 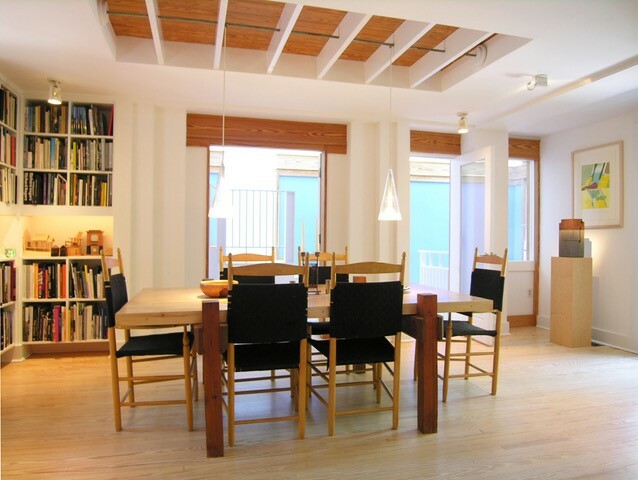 The passive solar design makes for low heating in summer and maximal sunlight in winter. 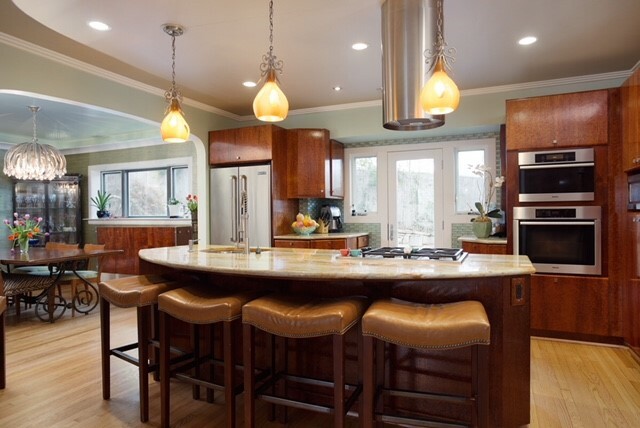 The kitchen is comfortable for family eating, but the large island makes it ideal for entertaining also. The gas stove and double oven with warming drawer are a chef’s delight, along with the array of top-notch appliances. The large gas grill just outside makes grilling or rotisserie easy in all seasons. The office area off the living room opens to a lap pool, heated to your comfort and open to the deck and the sky. The deck wraps around the entire back of the house and, since it looks out onto the park, is entirely private. 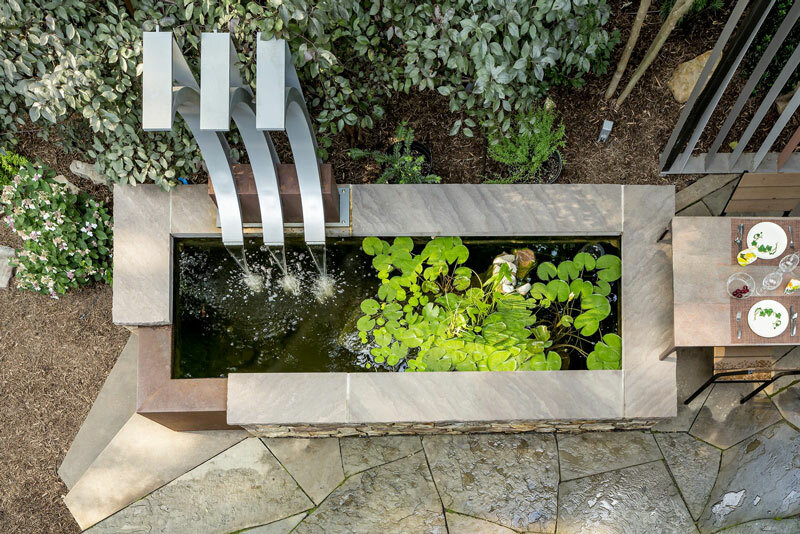 Two sides host a thriving lily pond and waterfall, the sound of which travels direct to the master bedroom above. That master bedroom is grand and has an attached balcony overlooking the waterfall. An entire two walls are set up for books, and the master suite includes two full dressing rooms and bathrooms, one with a huge walk-in shower and one with a jacuzzi tub. 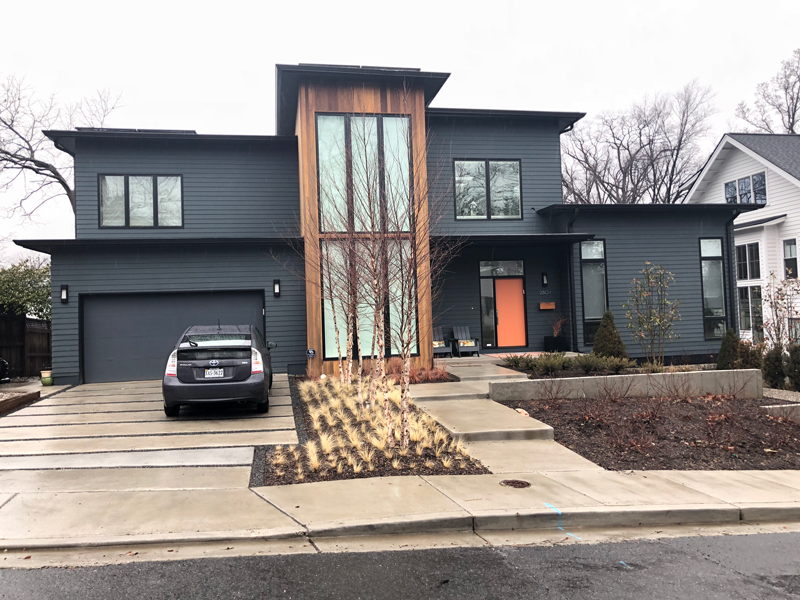 The current owners have converted what was originally two bedrooms into a high-performance home theatre, with surround sound, projection television, and large screen. What once were closets now store quite a variety of movies and music. The elevated seating area is mounted on rubber and the openings to the adjacent balcony are covered in black-out curtains to ensure a theatre experience in your own home. At the end of that balcony is a lovely guest room, complete with sky and clouds above. There’s another guest suite at the end of the first floor, and a den, a laundry room, a large basement, and a walk-in utility room. But a unique feature is the “room at the top,” originally designed for meditation and now used as an office, above the rooftops and directly connected to the largest roof, which provides quite a view of the woods in the park and which could be used for rooftop planting. The land itself is appealing, with a flat entrance and a pitched back yard. There’s a very useful garden shed and another shed under the deck. And it is all in a delightful community, with excellent schools, caring neighbors, and nearby groceries, restaurants, bus stops, and subways. Indeed, once Rock Creek Parkway is all renovated, the drive into Washington will be right through Rock Creek Park again. As it is now, the drive down 16th Street is still under 30 minutes to Capitol Hill or Foggy Bottom. So, a Travis Price home, comfortable for family life, easily used for major entertaining, and secluded in parkland while being part of a community. It’s a delight! The home is inspired by the simple and natural virtues of the site’s trees and vistas. The moment one walks in the new space, one’s immediately drawn to the back where the vistas have been cleverly framed. Nature is celebrated in full view! The design desires to merge with and blend into the adjacent park by harmonizing with its natural green colors. Through the use of glass railings and glass walls, the house reflectively displays the preserved trees and landscape surrounding it. 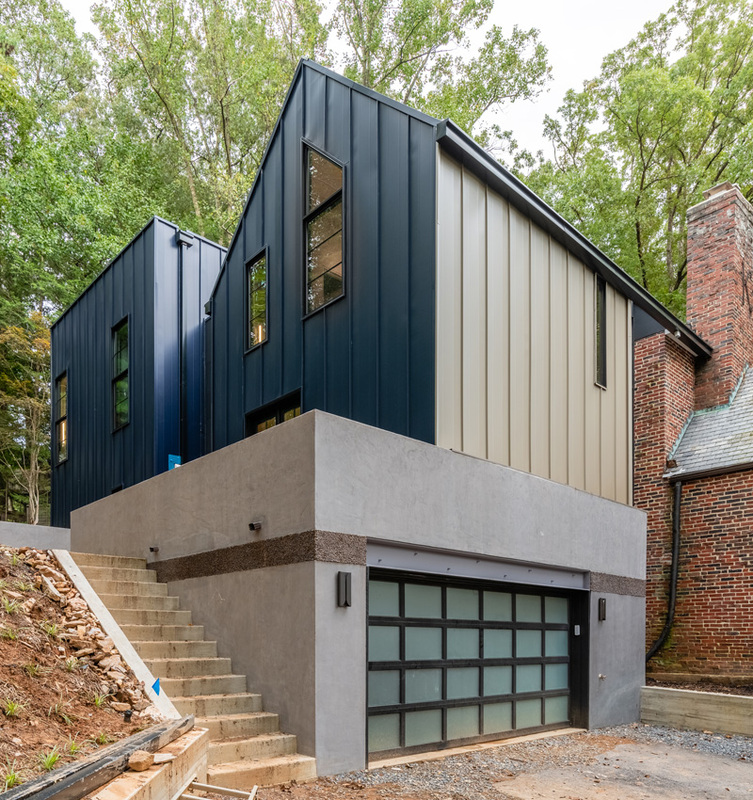 An abundance of new decks at multiple levels of the renovated house and new addition compensate for the lack of usable outdoor areas because of the steep terrain of the existing house. There is a tremendous amount of vertical tree action behind the house. This verticality was celebrated in the design of the stairwell, which consists of four stories of translucent library enclosed by Kalwall panels and wrapped with glass shelves in the interior. This “temple” was designed not to be filled all at once, but to grow into a wealth of art, books, and photographic images: a vertical museum, an eternal yet ephemeral lamp that serves as the intellectual and familial hub of the home. 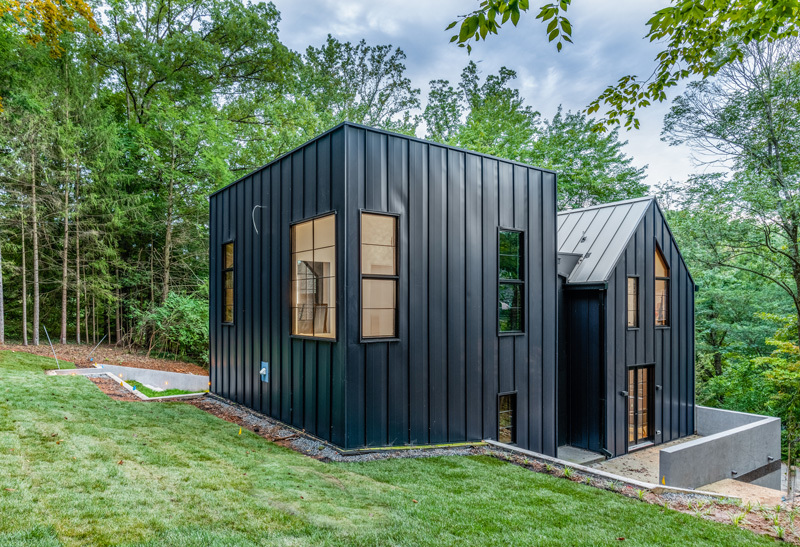 A substantial portion was added to the existing Tudor cottage style Slavin-Arnholz residence, which nearly doubled its size through the creation of a new four level structure, as a sculptural piece, on the rear of the house. The entire original house was gutted and integrated with the new addition, which was intentionally designed to create a powerful sense of movement toward the landscape in the back of the house. 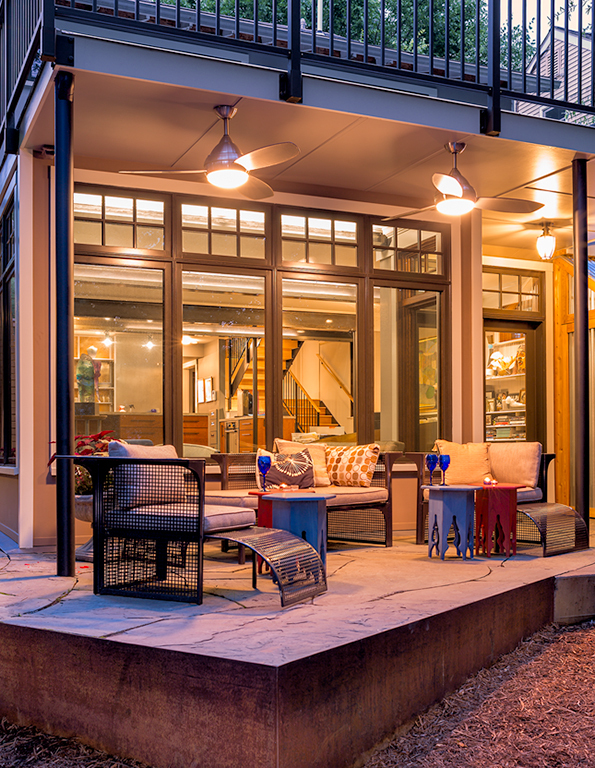 This little “complex” started as 4 run-down cottages from the 1920’s. The Architect bought them in 1978 and began work that continues to this day, first combining 2 of the cottages as his own house, then converting the remaining 2 structures to his office, which is also part of this tour. Gardens and a pool connect it all on this wooded hillside site. 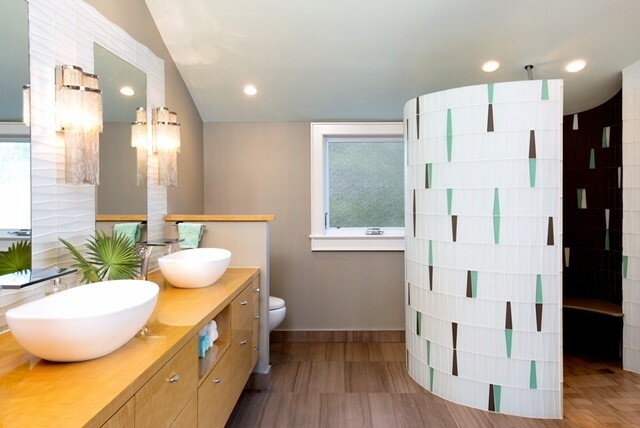 From the Owner/Interior Designer: The house is a mid- century stone and stucco home. 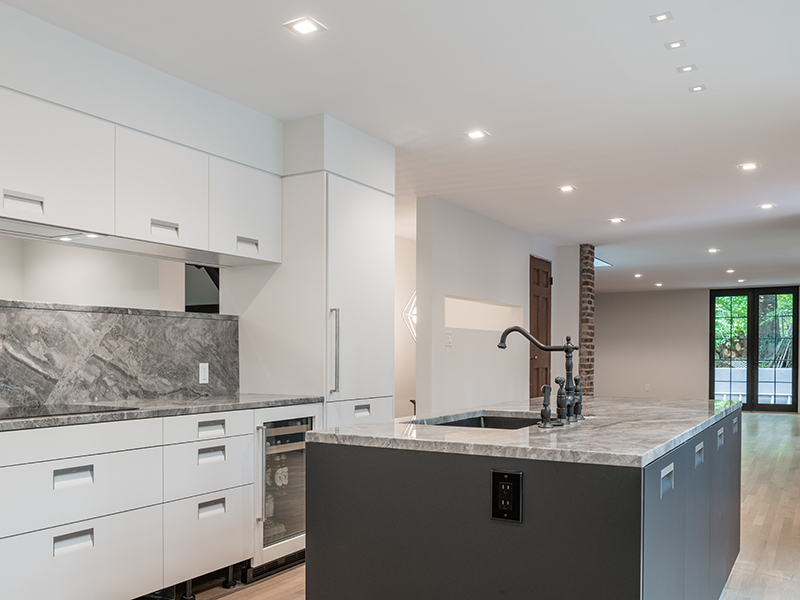 We have maintained as much of the footprint and layout as possible, with great pains to locate sources for replacement stone and recreating moldings, etc., including an original sink and toilet. 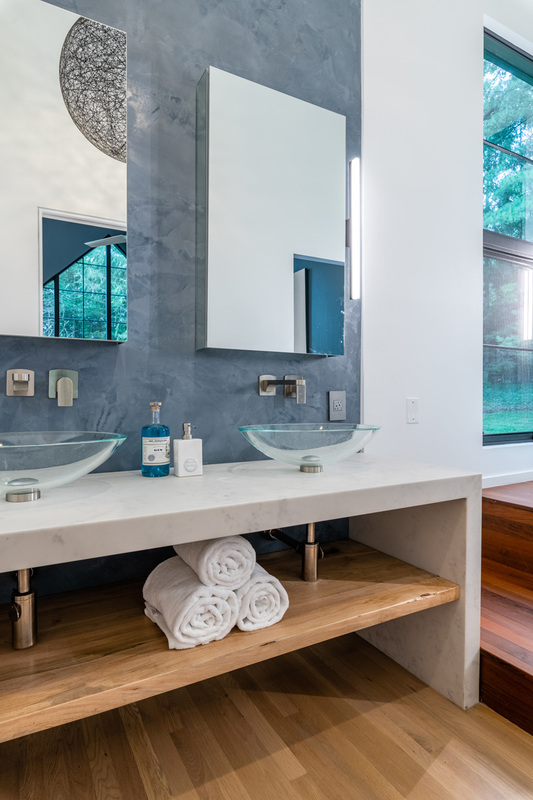 Although we have lovingly updated the house, it still maintains many of the original configurations, such as a first-floor bedroom and bath that were used by original owner/builder, and a screened in porch with louvered windows. The gardens are also lovely, and we’ve added a pond in the back, and a wonderful terrace for entertaining . 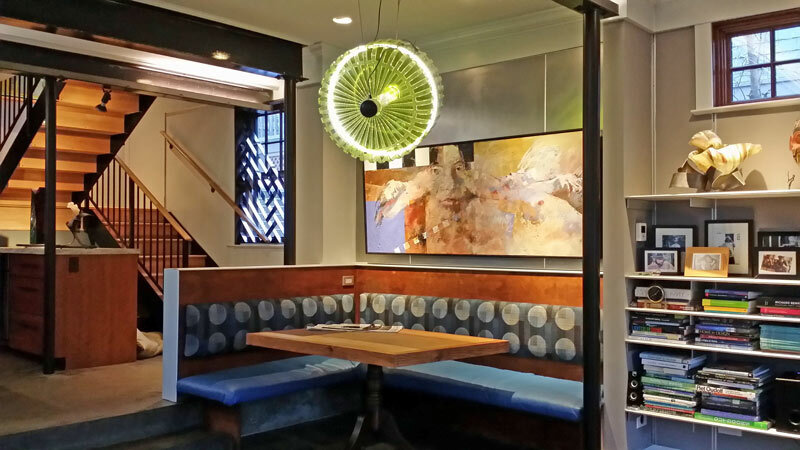 It has truly been a labor of love, and we [the owner/interior designer] look forward to sharing it with you. An architectural masterpiece, inside and out. 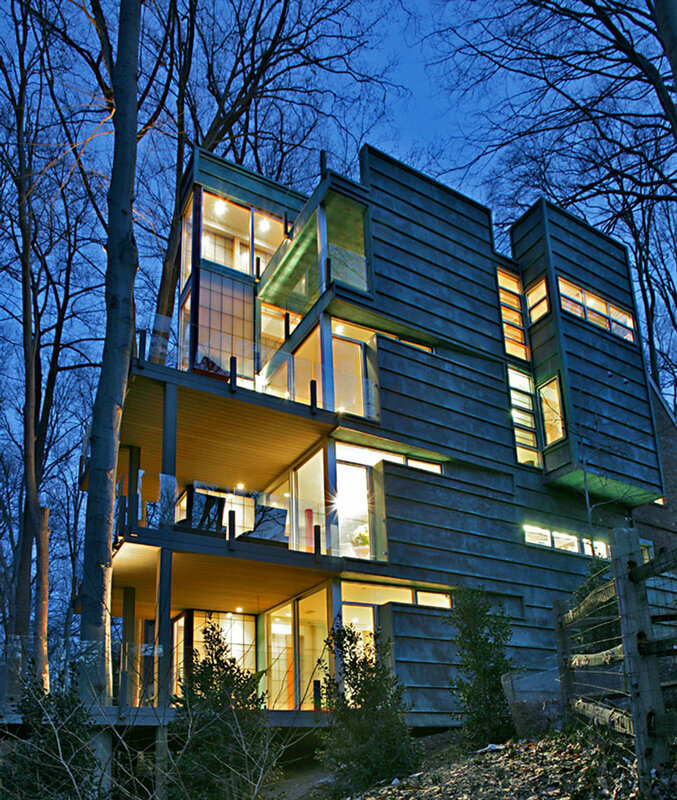 Designed by Yale trained Architect Angus MacDonald and built in 1997, it is a unique home filled with light and access to the outdoors. 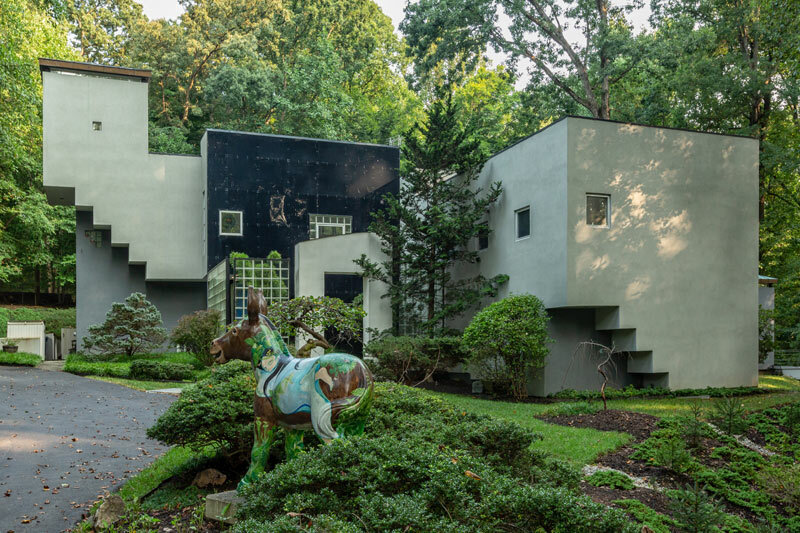 It has 7800 square feet of living space, plus a wonderful “sculpture garden” atrium seen from the entrance, the Great Room, the Dining room and through the 25-foot glass walls at the front of the house. With three large stone chimneys anchoring the three main living spaces, it is a perfectly balanced design. 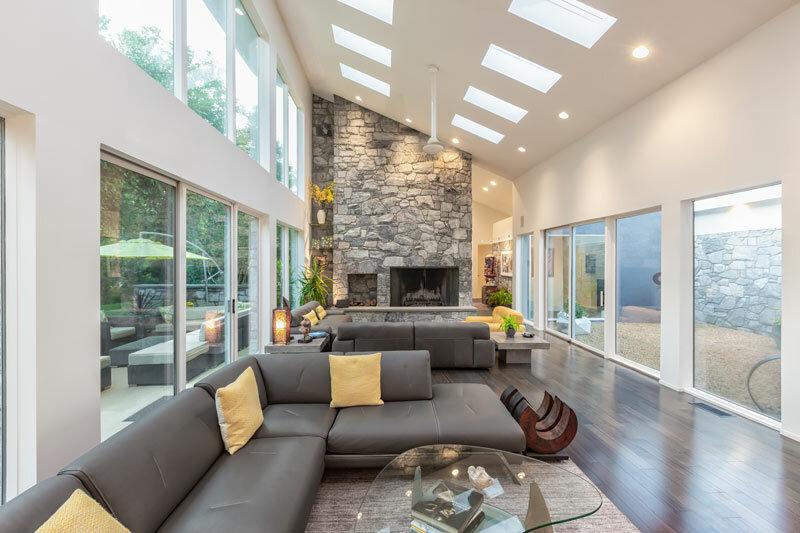 Constructed with stone, cement and steel by an architect who specializes in energy efficient and disaster-resistant construction, it is like no other home on the market. Architect MacDonald developed and patented the Am-Cor design and construction technique using cement and steel. Every living space has unobstructed, expansive views of the outdoors, with total privacy. Every detail is meticulously done in the classic contemporary style. The Great room, Dining room, kitchen and front and back patios flow seamlessly together for day to day living as well as the most formal to the most informal entertainment. The huge kitchen has two large islands, two Viking ovens, two dishwashers, a Subzero refrigerator and beautiful granite countertops throughout. 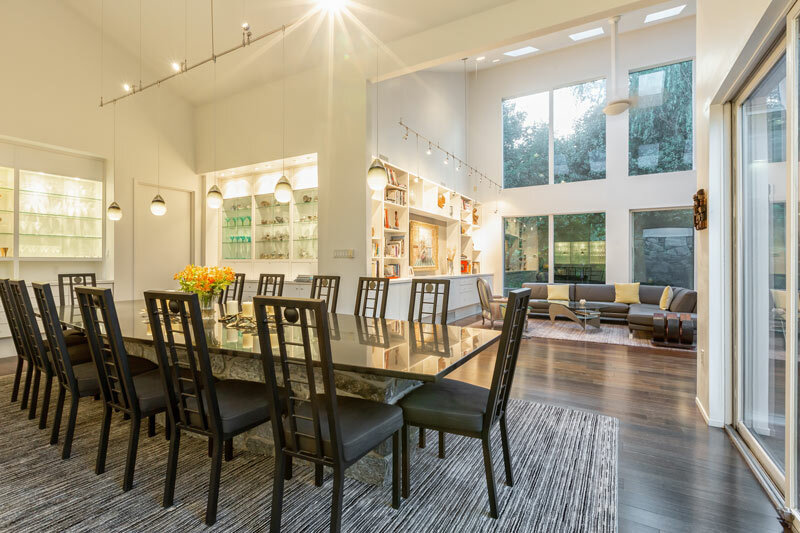 Another striking feature of the home is a built-in dining table with stone base and granite top, that seats fourteen. It serves as an ideal space for the most elegant dinners for Ambassadors and museum directors, as well as an indestructible space for teenage parties. The huge driveway easily accommodates 10 cars during a party. 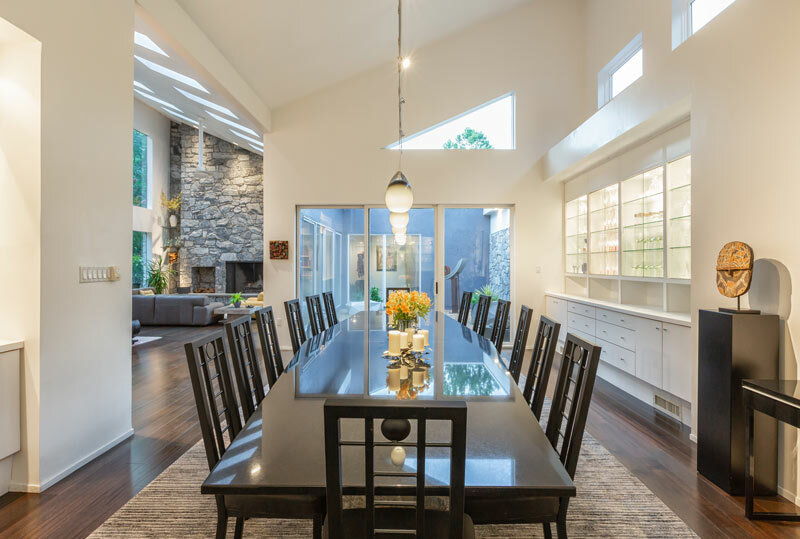 This Modern Prairie Style Custom Home curates mid-century and modern interior detailing into a warm and light filled space perfect for entertaining – small or large. The main level is anchored by an open kitchen-dining room, large family room, main level master-suite, and integrated outdoor courtyard living area. Layered ceiling heights and lighting allow for a dynamic range of lighting conditions and intimacy. 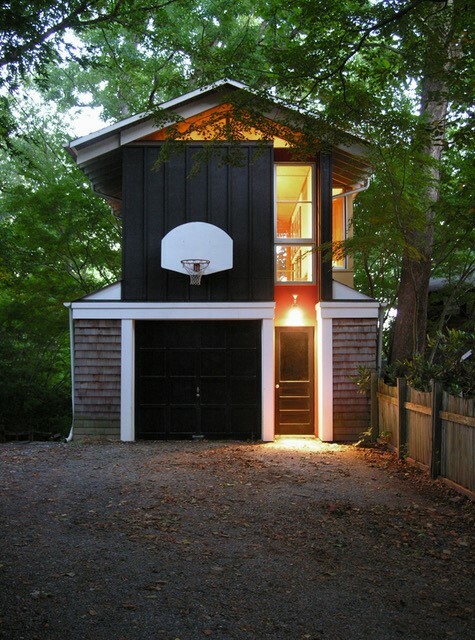 The second level features a lovely reading loft and 3 additional bedrooms. The lower level provides the Owners additional flexibility in entertaining spaces and guest accommodations. Thoughtful landscaping around the properties grounds compliment and build upon the language of the architecture. Sustainable features include a 10KW solar system, storm water planters, greenspeed heatpumps, and an Energystar envelope. Design and construction by Sagatov Design+Build. 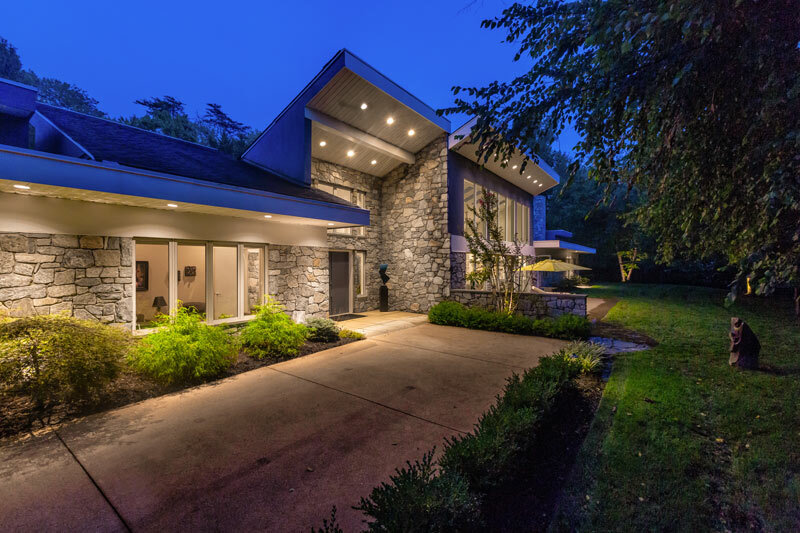 The Hillmead Residence sits in a remarkable 30,000 square foot lot. It stands guard perched up about 40ft above street level but, unlike some of its neighbors, it doesn’t dominate the landscape, it blends with it. 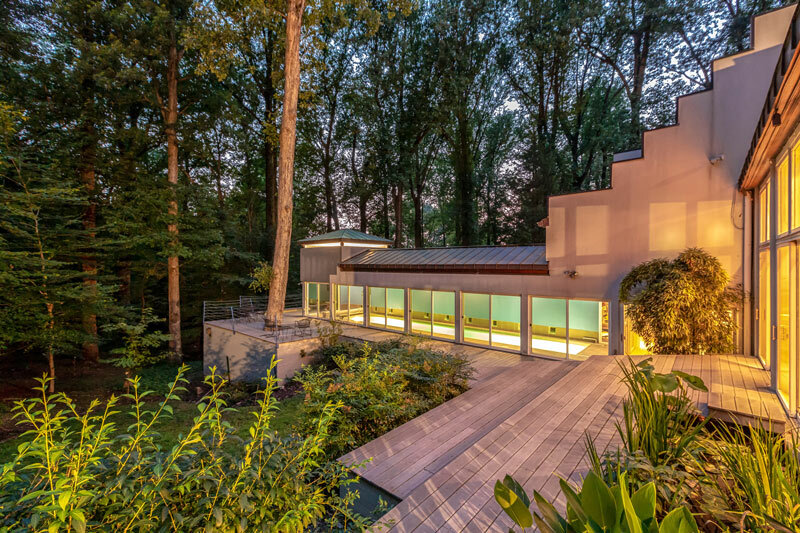 The original 1938 house was designed as part of a trend set by European-trained architects in the DC Area. 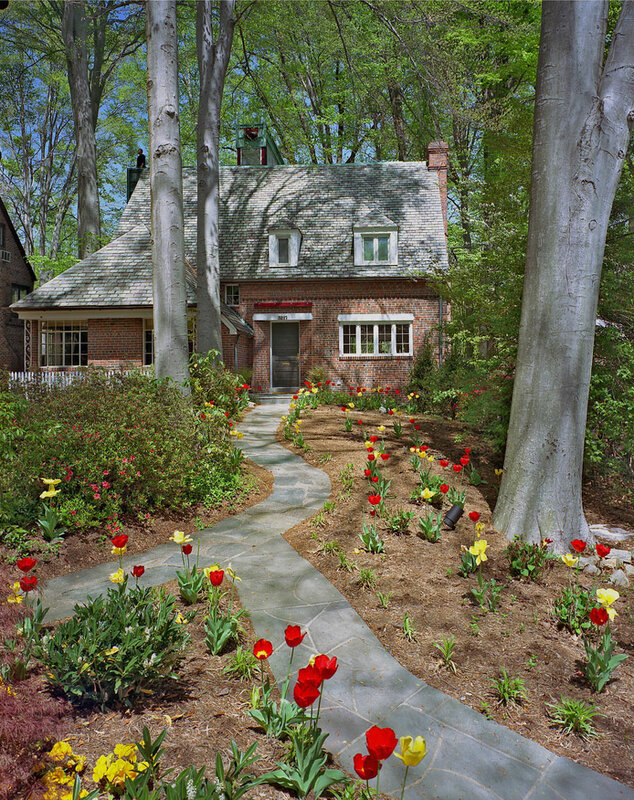 The original Tudor style home evoked a quintessentially British charm and had a strong architectural presence featuring uniquely irregular brick, steep gabled roofs covered in slate tiles, metal windows with leaded glass, dark interiors with wood panels, and exposed trussed ceilings, to name a few remarkable features. 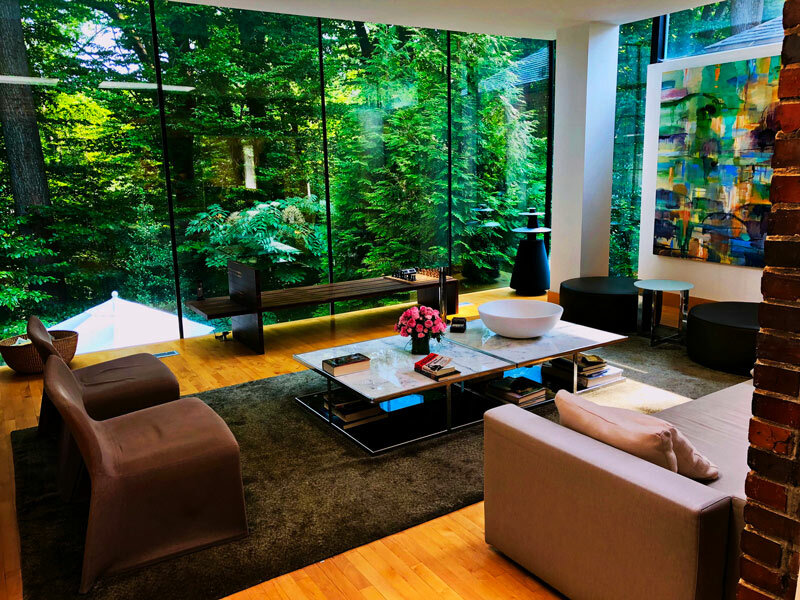 Upon studying the original drawings, the initial focus was to rediscover the original house by eliminating the 1980s additions which had simply been stuck on one end and in the back to expand the original kitchen. 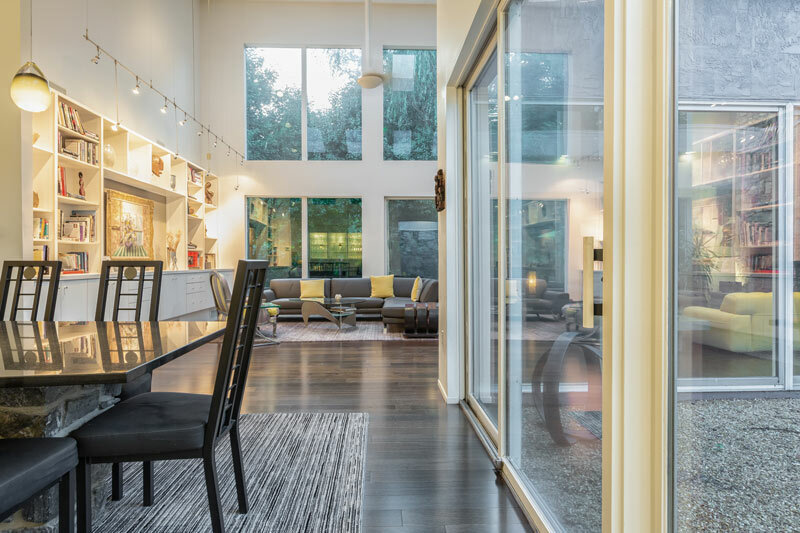 The original house had a stunning, double-height living room, with exposed wood trusses and a first floor with a kitchen, dining room and office. 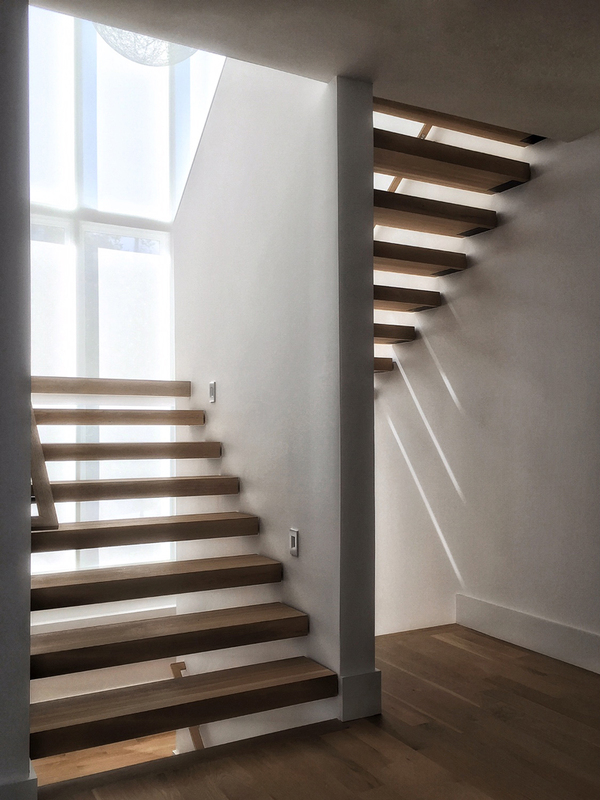 After climbing the original, but non-conforming, semi-circular staircase to the second floor, the house split into two bedrooms and a bathroom. To attach a modern addition to such a compact and elegant design required a careful study of its proportions and its placement on the site. Its proximity to the steep part of the site made the backyard non existent and the outdoor space very uncomfortable. 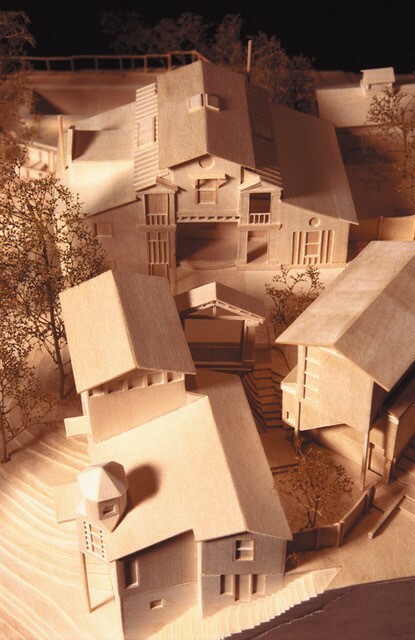 The first idea was to create a courtyard that would allow a continuous interaction between two buildings: the original house and a separate, but connected, addition. That connection between the old and the new became a glass-clad element and that’s where most of the circulation is located. The original residence has the same layout as before, but it is now completely open to the adjacent addition. The new European kitchen is in the same location, it is bright, and modern with some vintage accents. The original dining room and the stunning living room are in the same place, but they can now be viewed from multiple areas of the house. The first volume of the addition was originated completely from the proportions of the main house: it has the same width and the same roof pitch. This hosts the family room and a bedroom upstairs. The second volume hosts the master suite and a guest bedroom with a patio, and is connected by a glass and steel staircase. 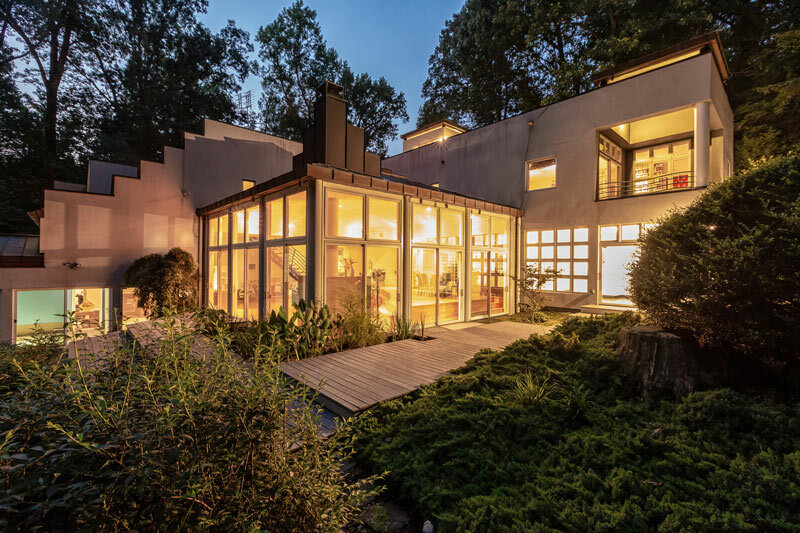 The new volume keeps the same proportions but, following a more modern approach, morphs into a cube towards the woods and features large windows that follow the 1938 house proportions. 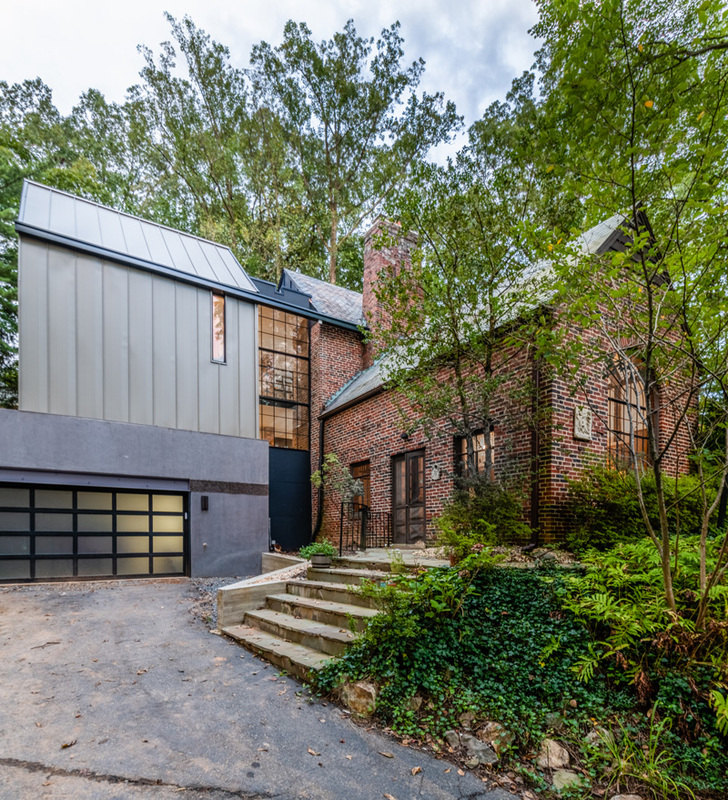 The addition forms an L with the original house and pays homage to it by using a modern version of the same industrial materials: metal, brick, glass, concrete, wood. Nestled into the steep hill, the new courtyard steps down from the landscape connecting the exterior of the two buildings. 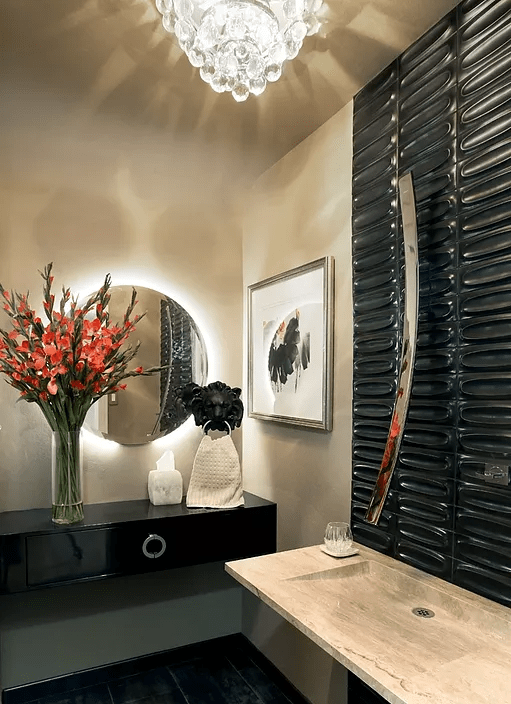 The result is a home with a more functional sequence of spaces for a more contemporary lifestyle. It’s easy! Just buy your tickets, then about 48 house before the Tour you’ll receive an email with links to your Tour map. Then, on Tour day, start at any house and proceed in any order at your own pace to the homes that interest you the most – or to all of them! Unfortunately due to repeated issues, we must request that no children under 12 attend the Tour. This is a new restriction for 2018, and we sincerely apologize for any inconvenience. However, we do realize that some of our best guests are aspiring architects and designers and we therefore invite kids 12 and up to learn about the exciting world of architecture and design! Giving back to the communities and homeowners that so generously welcome us every year is one of the most important things we do. That’s why we partner with a housing or education organization in every Tour city, and why we are working to establish a scholarship fund for aspiring architects and designers.